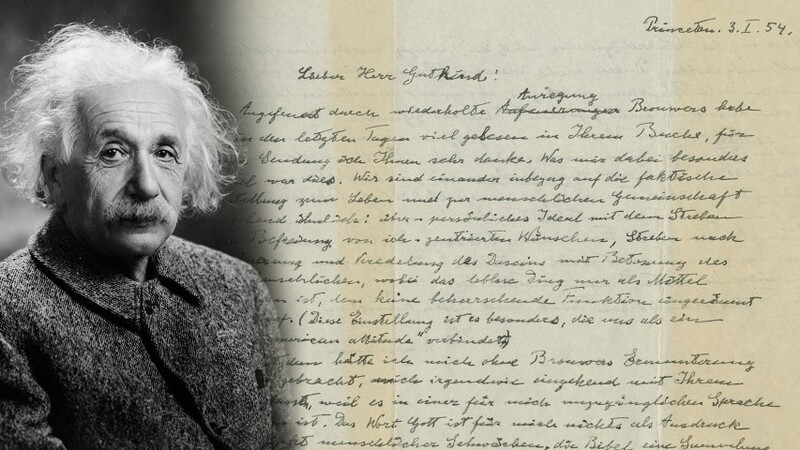 (RNS) — A handwritten 1954 letter by physicist Albert Einstein in which the Nobel laureate is dismissive of religion in general and Judaism in particular is expected to bring a seven-figure price when auctioned by Christie’s in New York City on Dec. 4. Einstein wrote the letter after reading Gutkind’s book “Choose Life: The Biblical Call to Revolt,” a volume urged upon him by Dutch philosopher and mathematician Luitzen Egbertus Jan Brouwer. Without Brouwer’s “repeated suggestion” that he read the book, Einstein wrote, he would not have engaged with the text because its arguments were “written in a language which is inaccessible to me,” specifically its spiritual references. Speaking with Religion News Service, Klarnet said he anticipates a ready market for the document, which the firm gave a “somewhat conservative” estimate as bringing $1 million to $1.5 million. In 2002, Christie’s sold one of two copies of the physicist’s 1939 letter to then-U.S. President Franklin D. Roosevelt, warning of Nazi Germany’s plans to develop atomic weaponry. That letter sold for $2 million, and since then interest in science-related items, such as first-edition copies of Sir Isaac Newton’s “Principia” and Charles Darwin’s “The Origin of Species,” has grown, according to Klarnet. Along with the 1939 Einstein-Roosevelt letter, Klarnet noted the more than $6 million paid in 2013 for a letter Francis Crick wrote to his son after the discovery of the structure of DNA. 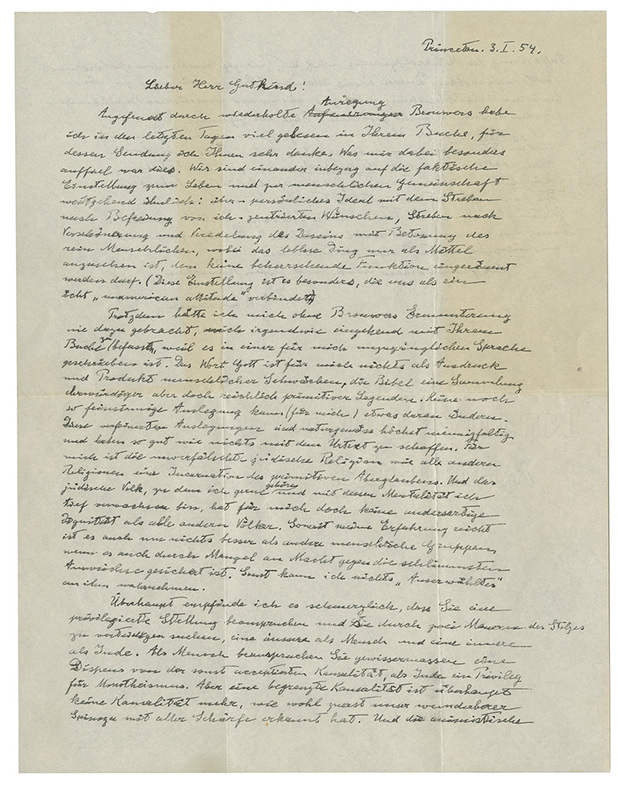 The Christie’s sale will come less than a month after another Einstein letter, in which he wrote in 1922 about his fears of growing anti-Semitism in his native Germany, sold at an auction in Israel for $32,000. Klarnet said the subtleties of Einstein’s philosophy were an aspect of the letter that could attract buyers. “Although Einstein did not believe in an anthropomorphic God (and wrote) that the Bible was a book of stories, he still believed people should have a moral foundation, but it was up to individuals to realize that,” Klarnet said. “The letter speaks to that and towards Einstein’s antipathy towards chauvinism, that he would place a religion he identified with on a pedestal above anyone else. That’s part of the magic of this letter and why it gets attention when it comes to the public eye,” he added. Compelling as the Einstein letter may be, one scholar cautions against wielding it as a cudgel for atheism, as noted atheist Richard Dawkins has claimed. Ironically, Dawkins was one of several underbidders when the “God letter” was last auctioned, in 2008 in London. But, Ryckman told RNS via email, Einstein echoes the beliefs of the Italian philosopher Baruch Spinoza about “God, or Nature” (“Deus, sive Natura,” in Spinoza’s “Ethics”). 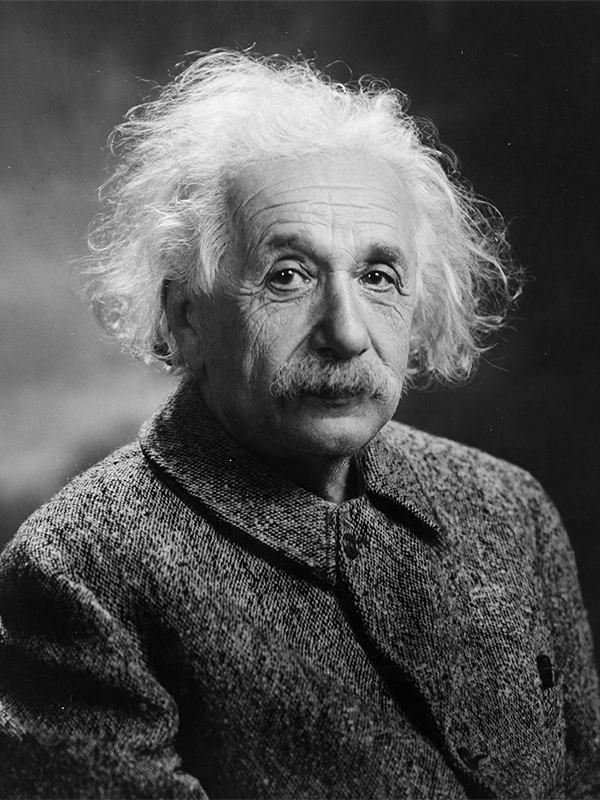 Einstein described in several other places the “religious feeling” he experienced when in 1915 he was “able to uncover some part of the ordered structure of nature,” specifically the relativistic theory of gravitation.